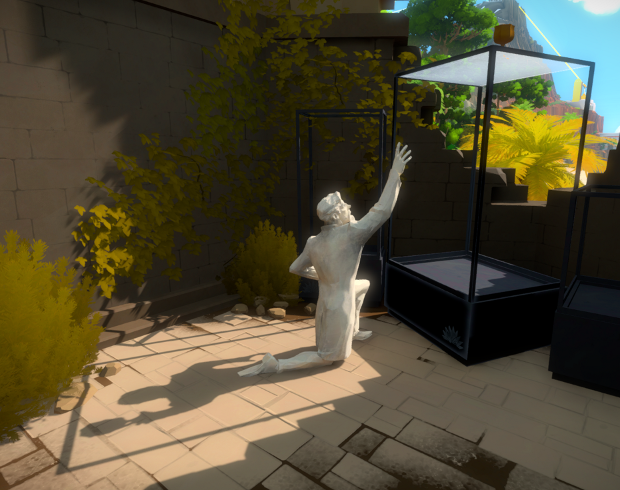 Now that I'm nearly done with The Witness I can write some words about it. I had been looking forward to this game for literally years, having absolutely loved Braid. When it finally launched, it delighted and did not disappoint. If you haven't played it and plan to, you should stop reading now, because at its core it is a game about discovery, and I don't want to be responsible for discovering anything for you. Despite my anticipation for the game, I knew very little about it before I started playing; I got the sense that I should go into it blind if possible. Still, I wasn't able to totally escape Twitter's blast of comments on the day it released. There was a lot about these line puzzles, and I saw screenshots of a few and started to wonder: if that's all there is in the game, am I really going to like it? And what's the point of building such a beautiful environment, if the core mechanic was standing in front of a static board and drawing lines. My first hour or so of the game did little to assuage my fears in this department. The game was pretty, but not photorealistic or mind-blowingly amazing. It just looked good. The first sets of puzzles were somewhat interesting, and I appreciated their pace with ramping you up on difficulty, but I wasn't sold yet. I came to the apple orchard and went through most of it, then got stuck on the last tree. Maybe some of you also did. I wandered around and looked through the gate. I saw the apple sitting on the table along with the broken branch, but didn't think much of it. I figured I might need to do something else first (I didn't know what kind of game this was yet), so I left and went to the sun temple. Later, as I was feeding my kid, I was struck by a revelation: the broken branch and the apple were a clue that the panel was created back when the tree had an apple on it, and later someone broke off the branch to eat the apple. I just needed to look at where the panel differed from the actual tree, and that broken spot would contain the missing apple! On multiple occasions, I'd be going through my waking life and be struck by such an epiphany about the game. That doesn't happen much with other games, and it's an amazing feeling. In this case I had an additional rush of emotion because I love that kind of storytelling through placement of subtle clues. I got stuck at first on the sun temple area, but this is where I had my first glimpse of what I came to love about the game. I only randomly happened to catch a flash of the sun across one of the panels, and of course it all became clear about the reflections and so on. Like most stages of the game, it was telling me that it was willing to subvert the puzzles you're used to in various ways, that some puzzles would need logical thinking and some would need lateral thinking. That was really enticing, because it reminded me of Antichamber. 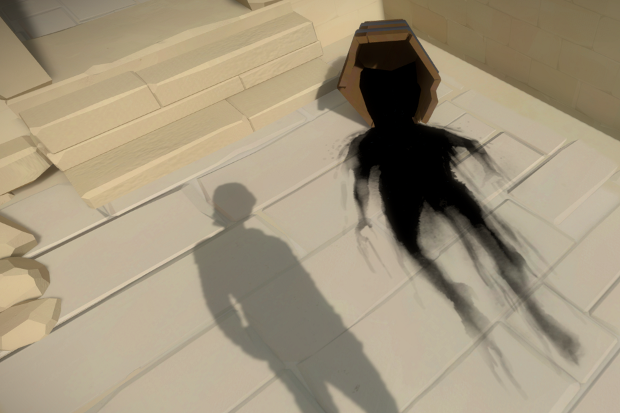 The other puzzle I liked in the sun temple was maybe the fourth or fifth in, where half the puzzle was in shadows. The catch was a hidden control mechanism behind it that moved it side to side, to illuminate one half or the other. 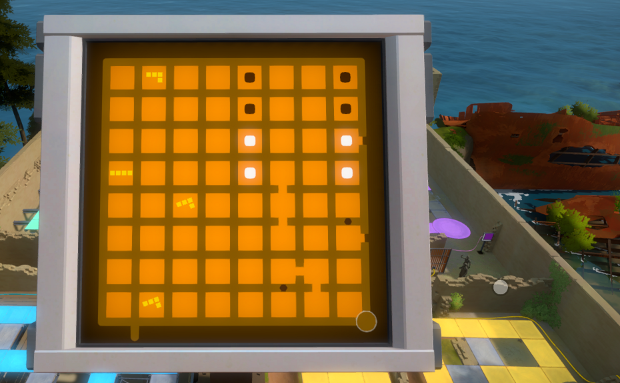 The game was once again reinforcing that even seemingly impossible puzzles are solvable by observing the right things. 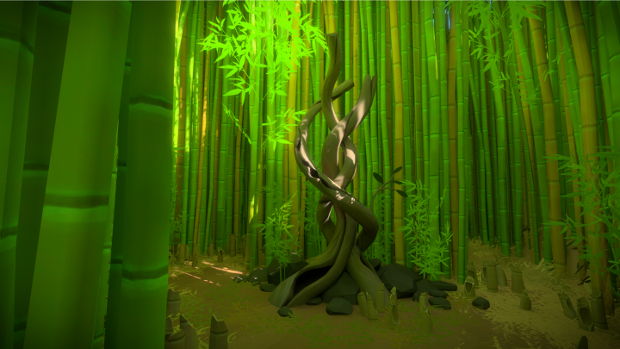 This was repeated with puzzles such as the last one in the Japanese temple and some of the hedge mazes in the castle. But that's not what really changed The Witness for me--you guys know where I'm going with this. It was the moment I walked away from the sun temple and looked back at its face. As I moved side to side, I happened to catch the sun on one of the big, golden medallions. Without expecting anything at all to happen, I tried to interact with it. I'm pretty sure my mouth dropped when it activated, and when I completed a line and it shot off into the distance, I shouted something or another and made my wife come to look. It's fun talking to other people about the game, because everyone had this same moment happen to them, and in all different places. Lines. Puzzles. Everywhere. Hidden throughout the world. It was from this point on that it went from being a fairly pretty game to one that blended a gorgeous world with meticulous craftsmanship. 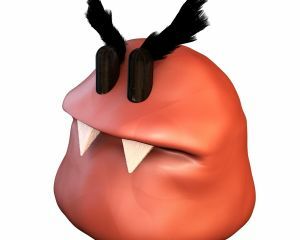 Listening to the excellent Giant Bomb interview, I was even more impressed: he talked about how they had to be very careful not to include circular shapes in any geometry, lest it be a red herring for the player. These environmental puzzles never disappointed, and I've been ravenously hunting them down, with only five or so left. I'd say the game is half about the environmental puzzles and half about the panel puzzles, which I started off lukewarm about, but came to appreciate more and more over time. Well, it's hard not to, after doing over five hundred of them. There are two particular aspects I especially like. There are many different elements that can appear on the panels, which add different constraints to your solution. Each one of these is its own kind of "language", a description I liked from one of my friends. At first, when you're just learning the language, it's not always obvious what some symbol means; it's possible to solve one of the early puzzles without fully understanding how the mechanism works. Then, coming to a harder one, you might get stumped because it looks impossible from your current understanding. What I like is that often among the early puzzles are ones that are simple, but have enough room to "ask it questions". In computer science, they call this an "oracle". Not sure how the black and white squares work with a third color? Try solving it in different wrong ways and see how the board flashes to hint at what parts were satisfied or not. Not sure how the tile block panels work? Draw different shapes and orientations and see which ones are accepted. The game gives you a certain progression of teaching puzzles that explores some but rarely all possibilities. It's up to you to push the boundaries a bit and learn for yourself. The curious player benefits here a lot. Over time you get really good at doing all the various types of puzzles. You can glance at a board and spot the line you need to draw in a moment. The constant repetition and variations on the mechanics help ensure this. When you get to the harder puzzles, such as the final one at the top of the castle area, which I struggled with for a while, your thinking shifts as you solve them. The second thing I like about the puzzles is that, though you start out thinking on a small scale about the various elements on the board, in the later puzzles you end up developing strategies for solving them. I have to go to the right from the start, or else I later won't be able to get that other piece. I can't draw a shape with a gap to the left, because I won't be able to complete it. I need to use the mine to eliminate that piece, because there's no other way to get it. Whereas a lot of puzzle games try and get you to feel that "aha!" moment, where everything suddenly clicks, this one doesn't do that with the panels (I think it comes closer with the environmental puzzles, actually). Instead, this game makes you feel smart by your slow and careful unraveling of the board into the correct plan of attack. It tries to cultivate this mindset throughout the game by making puzzles in certain areas penalize you for guessing. When you solve one of those harder puzzles, the feeling you have isn't "aha! "; it's "of course". It's satisfying in a way that I don't get from other puzzle games. But the game is not perfect, and a couple places were a bit sour. In particular, in the descent into the mountain, they gave some variations on earlier puzzles that simply involved making them harder to perceive--the panel moved around as you interacted with it, or spun rapidly, or shifted colors crazily. I felt like they didn't add anything. And the puzzles that wrapped around columns were a neat visual effect but likewise just forced you to memorize parts of the board, because they don't let you see it all at once. These things seemed out of place compared to the ramp-up in difficulty found elsewhere in the game. Still, I have this drive to find everything, because it calls to me with that joy of exploration and discovery. Finally, I would be remiss if I didn't mention the multiple quotes and segments featuring Richard Feynman, my greatest hero and the kind of embodiment of intellectual curiosity who completely fits the game. Truly, this game was built to match my sensibilities.